I have got plans for this. Last edited by ConnieD on Fri Jan 20, 2012 2:17 am, edited 1 time in total. As you can see, it has high quality worksmanship. 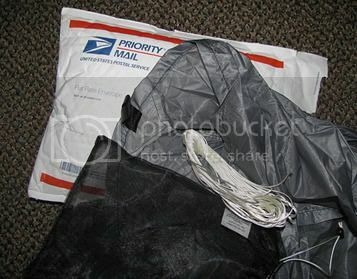 Here is an example of getting a taut pitch for a UL tarp like this one. Here is a demonstration of pitching a UL tarp. Here is a method for securing a UL tarp to shepherd hook or titanium nail tarp stakes. ConnieD wrote: As you can see, it has high quality worksmanship. This man is using two 5x7' Walmart UL tarps @ 16 oz. Last edited by ConnieD on Thu Jan 19, 2012 7:36 pm, edited 1 time in total. Maybe it remains in my browser cache ? I uploaded a sharper photo. I am showing it there. The IMG code is correct. It is not there ? Here is the kind of detail I want to show. I sent for this particular tarp, because I know he does good work. The Oware AsymTarp 1 intrigued me. I found out: the ridgeline is asymmetric. I could use this as a pattern, or, I could add a cut-to-fit mylar sheet. The other reason I sent for the Oware AsymTarp 1 is $59 as opposed to Metallized Tyvek® 60" x 10 linear yard rolls $75. I am considering Metallic Ripstop $19.95 yd and Seattle Fabric will sell 1/8 yd. increments. I thought I would D.I.Y. 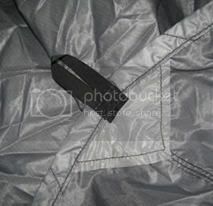 the SilNylon treatment. Last edited by ConnieD on Fri Jan 20, 2012 11:34 am, edited 1 time in total. Of course, you might use two 5x7 Walmart tarps like this man. The "pitch" is the whole point. You could do this "pitch" with a larger tarp. However, it will not pack down to as small a volume in the pack. It does let in the heat from the warming fire, without extra risk to the tarp, for example, a diamond pitch would make with one corner that could overhang the warming fire. It could rig that corner back on itself, nevertheless, that is carrying more tarp than you actually need for emergency shelter. I admit, the diamond-pitch is the fastest set-up as you can be under the tarp after the first corner goes up. I like the Oware AsymTarp 1, because it is the smallest "carry" for the purpose. I like the Oware AsymTarp 1, because it has the length and width most people could use with a bivy. I like the Oware AsymTarp 1, because it is well-constructed at 9 oz. I have been advocating having sufficient provisions in a daypack, waistpack, or one shoulder pack for an unintended overnight, or more. I have been advocating this idea for years. I intend to demonstrate "a good example". Last edited by ConnieD on Fri Jan 20, 2012 12:33 am, edited 4 times in total. Here is a website having a good photograph of Metallic Ripstop on 70d ripstop nylon. They have both shiny-finish and dull-finish metallic ripstop. David Olsen - Oware used 30d SilNylon ripstop. 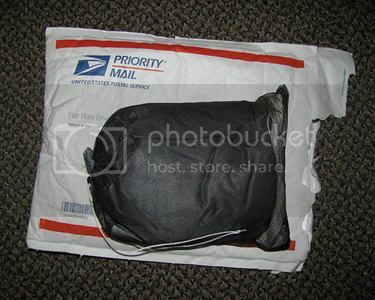 I am thinking 70d Metallic Ripstop treated with SilNylon, in a "hybrid" tarp wouldn't add much weight. The "hybrid" tarp idea, is using two different materials. The Metallic Nylon would only have to be the back panel. If the "hybrid" tarp volume is a small volume, this "hybrid" tarp idea would be acceptable for emergency use. Of course, "minimalists" would like this tarp. I like it, and I am not a "minimalist" backpacker. Last edited by ConnieD on Thu Jan 19, 2012 10:15 pm, edited 1 time in total.